Use store-bought puff pastry or make Puff Pastry following the recipe included in MasterCook. 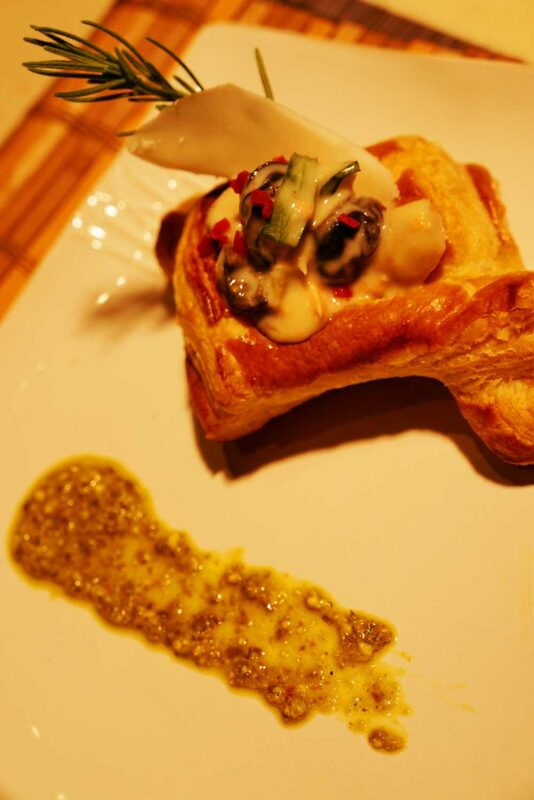 You will need to prepare the puff pastry by creating shells or vol au vonts. Choose your desired shape (here, diamonds, rounds, square cups), and bake according to the instructions on the packaging. Set aside. 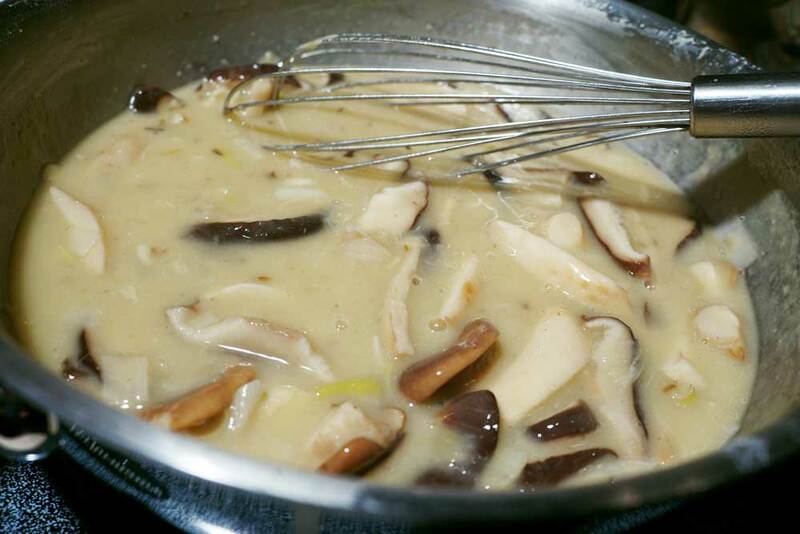 For the Velouté: In a medium sauce pan, add Snail stock (from one can Wild Burgundy Snails, Petit, Four Dozen), 2 Cups Chicken Stock, 1 Cup Water, Mushroom stems, and bits of fresh rosemary, tarragon and thyme. Bring to a boil, strain through a fine sieve and refrigerate until cold. To a dry, large sauce pan over medium-low heat, add the pancetta. Render until golden brown, stirring occasionally. Move the lardons to a paper towel to dry. Add olive oil to the rendered fat. Add onions, ginger, and cumin seeds, and toss to coat. Sweat onions gently, 2 minutes. 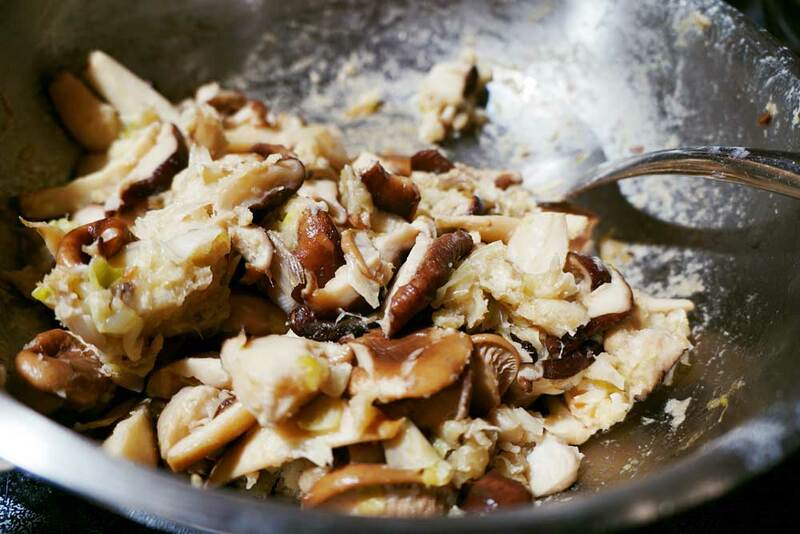 Add mushrooms, and toss. Add the garlic and fennel. Focus these flavors, stirring occasionally, until the pan is nearly dry. Sift in the flour and reduce heat to low. Stir. Yes, it’s a hot sticky mess, but we’re making a roux without creating more dishes. Be attentive. Scrape the bottom, stir regularly. No coloration. Cook for 10-15 minutes. Increase the heat to medium, and immediately whisk in one-half of the chilled broth. Gently whisk until smooth, scraping the bottom until clean. Add the remaining broth in halves until the desired consistency. Adjust heat: do not boil, but a very light simmer is appropriate. Add the snails, bay leaf, and heavy cream. Stir. [F] Remove from heat until ready to plate. For the poached salmon: in a medium sauce pan, combine the ingredients. Bring to a boil. Remove from heat and submerge the salmon. Allow to cook to desired doneness, perhaps 5 minutes. Gently remove salmon to a plate. When cool enough to handle, peel off the skin, and wipe clean the black fat. Gently pull apart the salmon, following the natural contours of the meat. Refrigerate. When ready to serve: reheat the puff pastry, and bring the velouté back to medium heat. Gently stir in the salmon, pancetta and tarragon. Remove bay leaf and ginger. Salt & pepper. Spoon into, or over vol au vents. Garnish with ribbons of cheese and a rosemary sprig. [G] To the side, add pesto or beurre rouge as desired. Serve immediately. Enjoy! A: Use store bought — or make your own using the recipe for Puff Pastry included in MasterCook. B: Use store purchased — or make your own using the recipe for Pesto included in MasterCook. C: You can make your own Beurre Rouge by using the recipe for Beurre Blanc included in MasterCook, substituting red wine for white. 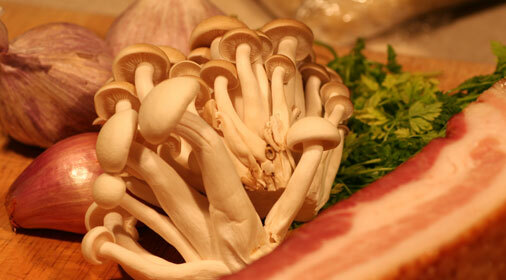 D: Don’t be afraid to use a few of those dried mushrooms you’ve got tucked away. E: The proteins here would work well with Chanterelles. Also Shitakes & King Trumpets are nice. F: If you find the velouté too thick at this point, simply add more of remaining broth and then chicken stock until desired consistency is reached. G: For a little splash of color, I also added a brunoise of fresno pepper.